Reception: Monday, May 12, 4:00 p.m. – 7:00 p.m.
Gallery Hours: Monday - Friday 8:a.m. – 4:30 p.m.
We're about to get VERY busy!!! Wed May 7 SENIOR'S LAST DAY! Mon May 19 Student's Last Day of School! Twenty-three Chadron High seniors have earned President's Academic Excellence Awards. The honor requires a cumulative grade point average of at least 3.5, coupled with a standardized test score in the 90th percentile in either English or mathematics on a nationally recognized test. The certificates and pins were presented during the annual Kiwanis program on April 24th. Hannah Andersen, Jacob Bargen, Jenna Banzhaf, Alec Burk, Matt Cerny, Miles Chasek, Cali Crile, Liz Darnell, Maaryn Davis, Spencer Eliason, Kaylee Gaswick, Peyton Hinn, Ashlea Kerr, Bailea Kerr, Logan Lembke, Alex Lutz, Kodi Milburn, Tristan Moore, Ashtyn Nelson, Kristavia Passero, Caston Stack, Jenny VanVleet, and Tatum Westemeier. I – Superior, II – Excellent, III – Good, IV – Fair, V – Needs Improvement. The Concert Band received a Superior rating. The Concert Choir and the Cardinal Singers received Excellent Ratings. The Chadron instrumental and vocal music programs had a very successful day at the District Contest. The following students received an Excellent rating from contest judges – Courtney Hageman (Trumpet), Phillip Duncan (Snare Drum), Miles Chasek (Bari Sax), Tim McClure (Clarinet), and Gabe Ramos (Trumpet). The following students received a Superior Rating from contest judges – Tristan Moore (Trumpet), Ashley Trent (Soprano), Madeline Clark (Flute), Simon Rischling (French Horn), Marquis Burwell (Alto Sax), Spencer Margetts (Trombone), Kia Emick & Shaylee Gunwall (Clarinet Duet). It should be noted that Ashley Trent and the clarinet duet of Shaylee Gunwall & Kia Emick each received Outstanding Performer Honorable Mention in their respective performing categories, and the concert band received a superior rating from all three judges. You can hear a repeat performances of the Concert Choir and Cardinal Singers at their spring concert on Thursday, May 1st at 7:00 p.m. The Chadron middle school choirs will also perform at this final concert of the year. The Instrumental department will giving their final concert of the year on Tuesday, May 6th at 7:00 p.m. and will feature the Chadron Middle School bands as well. All concerts will be held in the Chadron High School Auditorium. 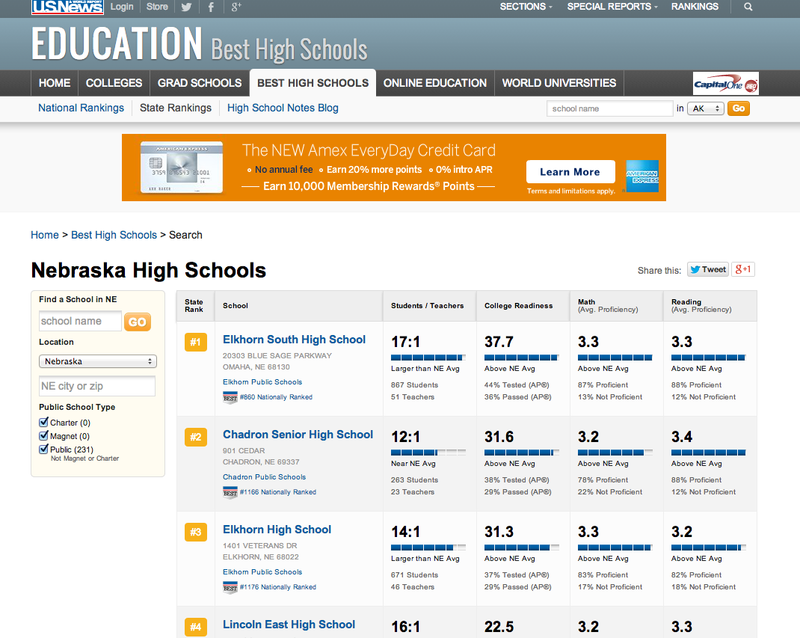 We are very proud ....and humbled to have recently been named one of the Best High Schools in Nebraska by U.S. News & World Report! We looked at thousands of public schools to identify the most outstanding. 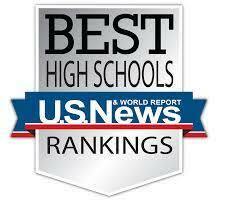 To produce the 2014 U.S. News & World Report Best High Schools rankings, U.S. News teamed up with the Washington, D.C.-based American Institutes for Research, one of the largest behavioral and social science research organizations in the world. AIR implemented the U.S. News comprehensive rankings methodology, which is based on the key principles that a great high school must serve all of its students well, not just those who are college bound, and that it must be able to produce measurable academic outcomes to show the school is successfully educating its student body across a range of performance indicators. A three-step process determined the Best High Schools. The first two steps ensured that the schools serve all of their students well, using performance on state proficiency tests as the benchmarks. For those schools that made it past the first two steps, a third step assessed the degree to which schools prepare students for college-level work. • Step 1: The first step determined whether each school's students were performing better than statistically expected for the average student in the state. We started by looking at reading and math results for all students on each state's high school proficiency tests. We then factored in the percentage of economically disadvantaged students – who tend to score lower – enrolled at the school to identify the schools that were performing better than statistical expectations. • Step 2: For those schools that made it past this first step, the second step determined whether the school's least-advantaged students – black, Hispanic and low-income – were performing better than average for similar students in the state. We compared each school's math and reading proficiency rates for disadvantaged students with the statewide results for these student groups and then selected schools that were performing better than this state average. • Step 3: Schools that made it through the first two steps became eligible to be judged nationally on the final step – college-readiness performance – using Advanced Placement or International Baccalaureate test data as the benchmarks for success, depending on which program was largest at the school. Personal Finance Team Wins 3rd at Regionals! Mrs. Brenda Budler entered her Personal Finance students into an online statewide competition sponsored by the Nebraska Council on Economic Education. This year, one team made up of Logan Lembke, Logan Gimeson and Jayden Garrett placed in the top five for the western Nebraska region. With the honors of placing in the top 5 out of 76 teams, they were invited to compete at the regional level in Kearney, NE on April 19th. Due to one member of the team not being able to attend, a substitute was made with Alex Lutz. This team competed against four other schools in the western region. Each team was given a hypothetical family scenario. They had two hours to create a PowerPoint presentation on their financial recommendations for the family. Each team had 10 minutes to present their financial plan to a panel of expert judges. The Chadron team ended up in 3rd place receiving a team trophy and $50 cash prize each. 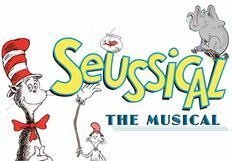 CHS Presents 'Seussical the Musical' This Weekend! Ticket are available to purchase at the door. Who: Current 9th, 10th, and 11th grade students that my participate in a CHS sport or other school activity next year. *Please pick up a physical form at the office BEFORE May 13th to complete the Health History portions of the form before you arrive for your physical. Who: Current 6th, 7th, and 8th grade students that my participate in a CMS or CHS sport or other school activity next year. The CHS Painting and Drawing Class is studying Illuminated Manuscripts. They are producing their own version of an Illuminated Letter. They are also busy preparing for the CHS Art Show which runs from May 5-15, on the CSC campus in Memorial Hall. 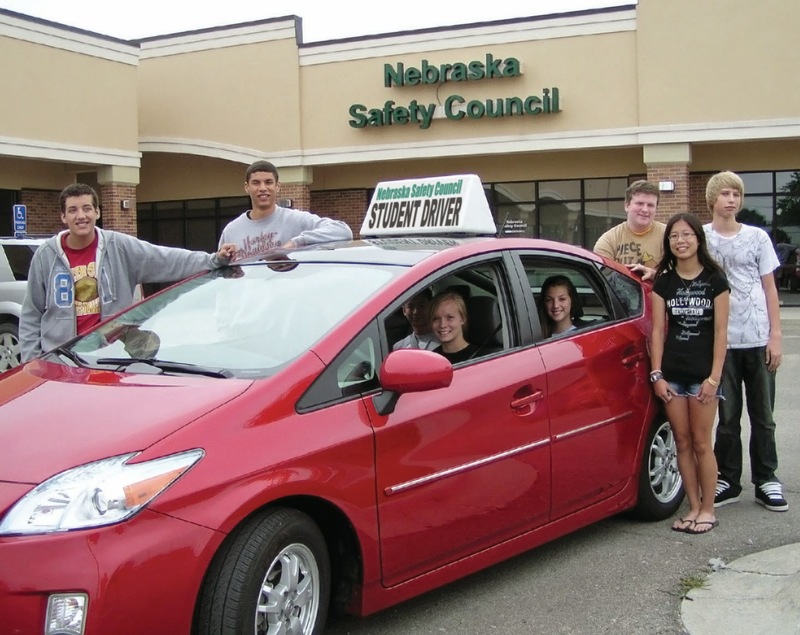 Students must possess a learner's permit. Times listed are for classroom. Driving dates and times will be scheduled separately. Cancellations received five (5) business days prior to the first classroom date will receive a full refund. A $25 charge will be assessed on late cancellations. 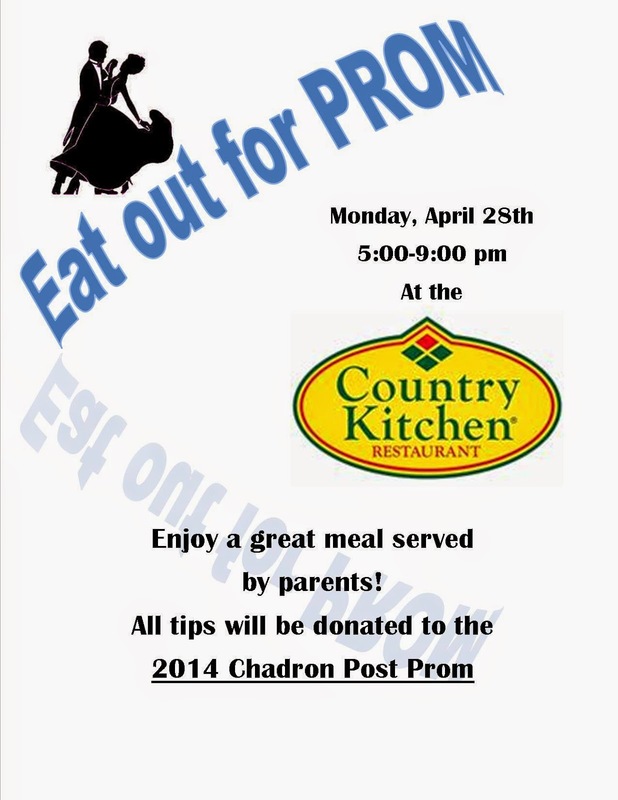 Chadron: Begins May 21, 2014 at 8:00 a.m. in Chadron High School. Wow! It takes a lot of courage and intestinal fortitude to step up and try something new (perhaps even a little scary) and that’s what members of the new Chadron FFA did. Wellnitz Wins State FFA Junior Speaking Contest! We're still waiting on a list of full results and pictures from the Nebraska State FFA Convention held in Lincoln this past week. This is Chadron High School's first year hosting an FFA Chapter in over 50 years. We excited to share some of the highlights from the State Convention. The biggest highlight came during the Friday night banquet when it was announced that CHS sophomore, Kane Wellnitz was named the State Champion in the Junior Public Speaking contest! Chadron Agriscience Team was awarded a blue ribbon. CHS Personal Finance Team Qualifies For Regional Contest! We received notice this past weekend that Chadron High School has qualified a team to compete at the Finance Challenge Regional Competition in Kearney on April 19th. Mrs. Buldler entered teams of three from her Personal Finance class. The team consisting of: Jayden Garrett, Logan Gimeson, and Logan Lembke finished in the top five of all Western Nebraska teams earning the regional berth. This statewide contest is sponsored by the Nebraska Council on Economic Education. There is big prize money up for grabs at the Regional Competitions! Each regional competition will have 1st, 2nd, and 3rd place winners. The three 1st place regional winners will be ranked by their scores from the preliminary online round of competition to determine the State Champion team, and 2nd and 3rd overall in the state. The regional winner with highest online score will be awarded 1st place and will be the state championship team moving on to the National competition in St. Louis on May 2. All travel expenses will be paid for all team members and the teacher. Each team member will receive a $2000 Nebraska College Savings Plan. The regional winner awarded 2nd place will earn a $1000 Nebraska College Savings Plan for each team member. The regional winner awarded 3rd place will earn a $500 Nebraska College Savings Plan for each team member. The second and third place winning teams in each region will also receive prize money. 2nd place regional winning team members each will receive a $100 cash prize. 3rd place regional winning team members each will receive a $50 each cash prize. Each team will be given a hypothetical family scenario. They will have two hours to create a PowerPoint presentation on their financial recommendations for the family. Each team will have 10 minutes to present their financial plan to our panel of expert judges. Teams must bring their own laptop computer(s). Each team will have a private study area for working. Free wireless Internet access is available in the building. Along with many hours of taking notes and studying, Mr. Bradley's Advanced Biology class opened up a world of hands-on learning activities. Not only has the class dissected crawfish, and frogs, but recently they were able to dissect a turtle. The class learned many skills during this lab, listening and following directions on a paper, teamwork, and the slow and steady hands of a scientist dissecting its specimen. The class was divided up into groups of two, each group received their own materials and turtle to dissect. The process was difficult. The removal of the shell allowed the students to realize the importance of the turtle's protection, and how strong it really was. Following each step, the groups carefully analyzed the organs inside the turtle, allowing them to see where these systems take place, broadening their understanding of how a turtle's internal organs work. After tedious work sorting and identifying structures and organs students answered questions in the lab worksheet. All of the steps that they took improved their knowledge of the turtle and showed another efficient method of studying, hands-on. The students greatly enjoyed the lab and learning about the turtle. Congratulations to CHS Scholastic Contest Winners! Chadron High School competed in the 2014 CSC Scholastic Contest on Friday, April 4th. Chadron HS finished 4th out of 14 schools in Division III (1st - Wright HS, 2nd - St. Thomas More HS, 3rd - Bridgeport HS). We're very excited to host the Nebraska Loves Public Schools film crew today. Several staff and student interviews are taking place as well as cameras filming footage in our halls and classrooms. The film is focussed on individualized instruction of students. We'll anxiously await the final production which will air on The State of Education in Nebraska series on NET2 this June. Videos can also be found on nelovesps.org.